Dillinger is pictured in Dayton, Ohio, shortly after his arrest and prior to his transfer to Lima. As Dillinger continued his crime spree so did the police continue its hunt for him, and sometime in early September they learned that Dillinger was expected to visit Longnaker’s Dayton, Ohio, apartment. Police rented a room in the same building and waited. By late September, however, they had more pressing matters to attend to and on Friday, Sept. 22, they suspended the stakeout. They instructed Longnaker’s landlady, Lucille Stricker, to call them if Dillinger should appear. 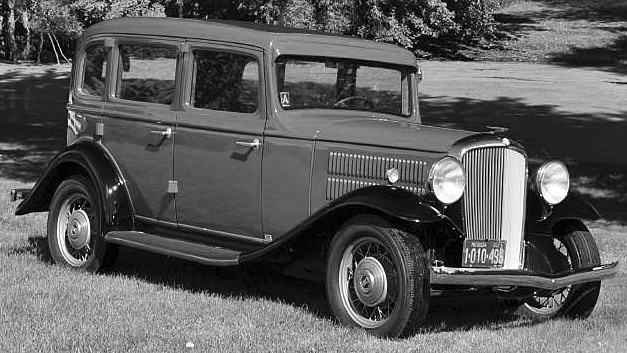 Shortly before midnight on the 22nd, Stricker saw Dillinger pull up in a dark-colored Hudson Terraplane, enter the building and go up the back stairs to Longnaker’s apartment. According to various swore statements, when she saw Dillinger enter Longnaker’s rooms, she called police and said, “He’s here.” “Who?” asked police. “Dillinger, you dumb flatfoot,” she said. Police were dispatched and as one officer stayed outside, Detectives Charlie Gross, armed with a machine gun, and Russell Pfauhl, armed with a shotgun, entered Longnaker’s rooms shortly after 1 a.m. When they entered, they later said, they found Dillinger, wearing a t-shirt and grey suit pants, standing in the middle of the room. Ironically, he was looking at photos of himself and police officers taken at the World’s Fair. Phauhl said, “Stick ‘em, John. We’re police officers.” Dillinger began to raise his hands and released the photos. As he did so, he lowered his hands slightly. “Don’t, John. I’ll kill you,” said Phauhl. Just then, Longnaker appeared to faint and fell to Dillinger’s feet, but police weren’t convinced. “Get on your hands and knees and crawl back to where you came from,” said Phauhl. She immediately did. Searching the room and Dillinger, police find a .38 between the cushions of a sofa, a suitcase containing five guns, and two more on him. They also found a crude diagram marked with Xs that they failed to understand. Dillinger is questioned about the drawing but refused to explain it. The paper was, in fact, a plan for a mass escape from the Indiana State Prison. (See story elsewhere on this site.) Just as his friends inside were about to break out, Dillinger was on a legal path back there. Dillinger was taken to the Dayton police station and within a few days transferred to the Allen County Jail in Lima to be held for indictment in connection to the Bluffton robbery. At left is a 1933 Hudson Terraplane Sedan, similar to the one driven by Dillinger. 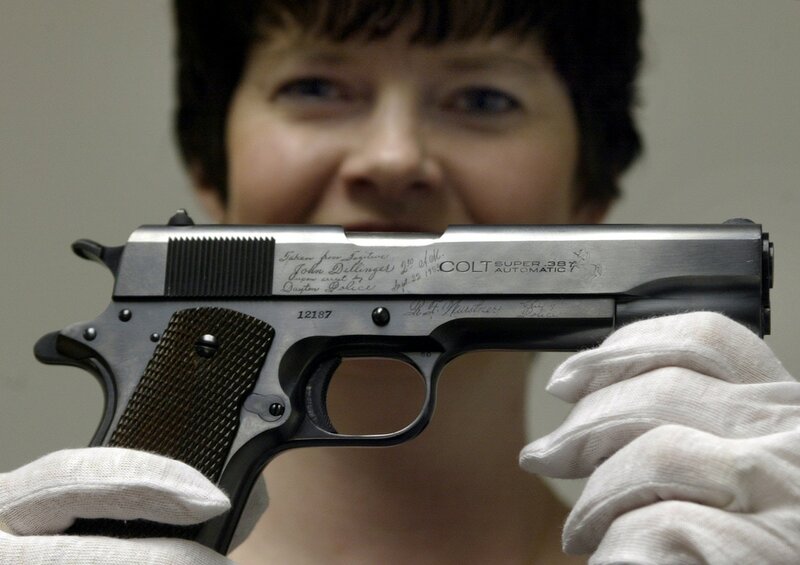 At right, a member of the Dayton Historical Society displays one of the .45s taken from Dillinger the night he was arrested at Longnaker's apartment. Dillinger's name and other information is engraved on the gun. The engraving was added by the historical society years later.